Amaju Pinnick has been re-elected as President of the Nigeria Football Federation (NFF). 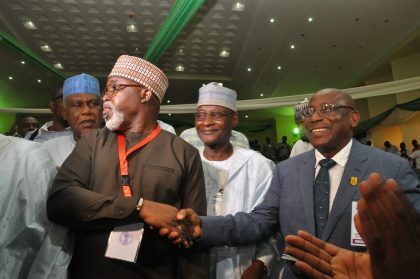 Announcing the result on Thursday in Katsina, the Chairman of Electoral Committee, Mr Mohamned Sani, said Pinnick scored 34 out of the 44 votes cast in the election. Sani said that Aminu Maigari got eight votes to emerge second, while Taiwo Ogunjobi had two votes, and Chinedu Okoye had no vote. The position of First-Vice President went to Seyi Akinwumi who polled 41 votes and his contender, Sunday Adelajayi scored two votes. Also, Ibrahim Gusau was re-elected Chairman of FA Chairmen unopposed following the withdrawal of Ifeanyi Uba from the contest. In spite of the withdrawal, Gusau had 42 votes, while Uba had one vote.